Ethnic disparity in economic well-being in China is drawing more and more attention from researchers. Past efforts for estimating ethnic disparities relied only on survey data in yearbooks or other statistical data obtained at the province or county level, which is usually limited by specific administrative boundaries that may not reflect ethnic differences. The details of ethnic disparities in economic well-being across all ethnic groups still remain unknown. In this study, we analyzed ethnic disparity in economic well-being in China over a 13-year period using nighttime light imagery and obtained a detailed and relatively accurate understanding of these disparities. This study presents and discusses the ranking of ethnic groups in China in terms of economic well-being and human development level, as well as their development patterns. We also make a comparison between the non-Han Chinese and the Han Chinese and find that non-Han ethnic groups as a whole have higher economic levels of well-being than do the Han Chinese. Although the human development level of the non-Han Chinese is lower than that of the Han Chinese, the human development level of non-Han Chinese is increasing all the time, and the disparity between them fell from 2001 to 2013, except in 2011. 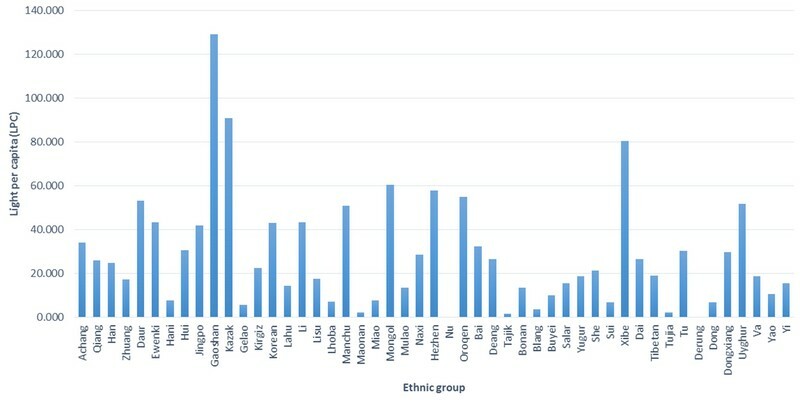 This study introduces a simple, convenient, and cost-effective way to measure ethnic disparities in economic well-being across ethnic groups and provides a detailed approximation of these disparities in China over a 13-year period, which will help inform policy makers in their future decisionmaking regarding ethnic-related issues. Jianzheng Liu, and Weifeng Li. 2014. “A nighttime light imagery estimation of ethnic disparity in economic well-being in mainland China and Taiwan (2001–2013)” Eurasian Geography and Economics 55 (6):691-714. doi: 10.1080/15387216.2015.1041147.